As for what OCF does, some think it runs the gamut from ministry work pumped out of a national office, or from our conference centers in Pennsylvania or Colorado, or something that takes place at special events like ROTC retreats or winter camps. Over the past two years in their work with the new Strategic Framework, both OCF Council and staff members have been seeking from God a clear picture of what He intends for OCF to be and has called OCF to do. Christ-followers. All members—regular and associate—follow Jesus Christ: called and empowered by Him to serve in His gospel message. Leaders. We are leaders entrusted with being responsible for others. This special role is invaluable to Jesus’ redemptive work. Indigenous. We are members of the military society, and as such, we possess great potential for uniquely serving Christ from within the military community. Just as our Lord prayed to His Father, “As you sent me into the world, so I have sent them into the world,” we too are sent in our common faith, uniquely gifted in leadership and equipped by the Holy Spirit to live powerfully within our military communities. 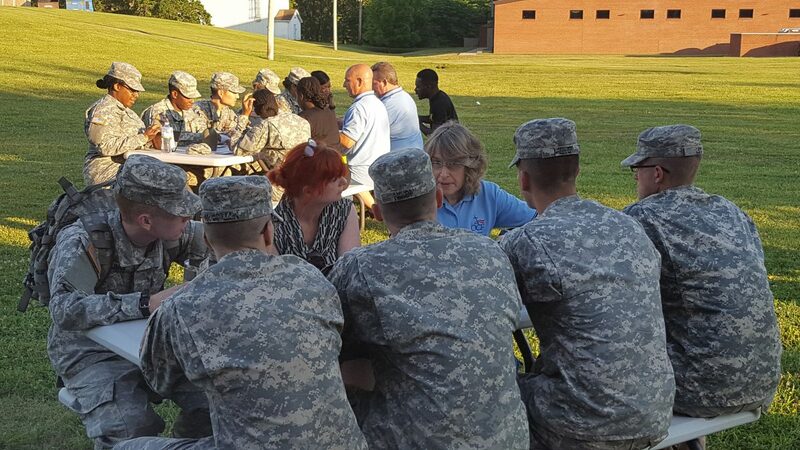 A team of twenty Bible study leaders under the leadership of a retired officer hosted twice-weekly studies for Army cadets who attended chapel during their free time at the annual ROTC summer training at Fort Knox, Kentucky. This year the team engaged 523 cadets in Bible studies centering on their upcoming roles as Christian military leaders. The wife of an active duty officer stepped up to assume leadership of the chapel community youth group following a vacancy. She formed a team of co-leaders, established spiritual growth programs, and organized youth to support the family and adult chapel programs. A retired Navy couple at Annapolis opened their home to two midshipmen desiring Christian fellowship, who subsequently invited others. Many other mids are now also enjoying the warm, generous, and loving hospitality of this caring OCF couple. At the annual ROTC summer training for Army cadets at Fort Knox, Kentucky, a team of twenty Bible study leaders under the leadership of one retired officer hosted Bible studies for cadets after chapel services. A USCG lieutenant rescue pilot stationed near Houston, Texas, hoisted people out of danger and conducted medical transports during the flooding from Hurricane Harvey. His excellent work to rescue and treat those in peril persisted despite long hours of mind-numbing exhaustion and dangerous conditions. Nearly 50 OCF members serve as greeters of new members, providing a personal touch from OCF. They welcome and encourage each one into the Fellowship as they engage in their Christian military journey. A senior NCO served as the senior leader at the U.S. Disciplinary Barracks Special Housing Unit that houses inmates convicted of capital crimes, such as the Fort Hood gunman. In the midst of extremely stressful situations at the prison, this NCO guided MP guards to maintain order among the most incorrigible of inmates while treating all of them with dignity. The couple is coordinating with the base chaplain in preparation for expanding a study at the chapel into three studies in local leaders’ homes, all while engaging scores of others in fellowship and growth. Despite working extreme hours on national military strategy as a key staff officer, an OCF Council member serves his church as the “captain” for its discipleship program for children. Seasoned military leaders take their sons and daughters through Spring Canyon’s Father Teen Adventure weeks to bond and strengthen relationships buffeted by deployments, constant moves, and cultural challenges. One of the week’s highlights is a ceremony where dads bless their children by affirming and lovingly charging them to walk in God’s paths. These are just a few extraordinary examples of OCF members living out their faith at the intersection of family and profession. What OCF does to realize its vision is not primarily through the Council, which has the essential task of guiding our strategic direction, nor the small staff who executes the Council’s direction and seeks to equip OCF members. It is you, the OCF member, who God seeks to use to serve at the intersection of faith, family, and profession in the military community. You are OCF.